How frustrated it would be if you like eating something delicious and you have the exact recipe you want! A case in point, the Egg Waffle (雞蛋仔) is my most favourite street snack enjoyed from my childhood in Hong Kong. Although I’ve got the wonderful recipe, I can’t try it out simply because I don’t have the mould. Having said that, I can’t blame anything as life treats me good enough. On the boxing day, I came across this electric Dutch pancake pan offered at Kmart at a crazy price, 12 dollars for each. What a bargain! My hubby talked me into it and finally we grabbed one back home. How wonderful it was when tasting the first batch of homemade puffy Poffertjes (Dutch pancakes) coming out straight from the hot pan. If you don’t have the pan, don’t be frustrated. Unlike the Hong Kong egg waffles, you still can taste the goodies, by using the recipe to pan fry some if you’re craving. Make the pancakes as small as you can, the taste is still delicious. Combine flour and baking powder. Mix in sugar and salt. Pour in milk, water. Combine with a balloon whisk. Add the eggs. Don’t over stir anyway, and avoid from producing gluten inside the batter, just combine all ingredients. Rest for 10 minutes. Turn on the electric pancake pan according to the manufactory’s instructions. Brush a bit of oil on the pan. Pour in about one tablespoon of batter into each hole. When bubbles appear, bottoms turn lightly brown, use a skew or needle to flip over and cook the other side. They should be cooked until both sides are golden brown. Transfer onto a serving plate, served with maple syrup or honey, sprinkle icing sugar on top. When mixing the batter, just combine all ingredients, don’t over stir it. The batter should be runny. The fried pancakes won't be soft otherwise. Add water if the batter is too thick. You might like to add some fillings between two pieces of pancakes, like jam or fruits. I tried to go with vanilla ice cream. It’s incredibly tasty. Another gadget that i want but I should stop getting anymore. so cute! that IS a great bargain! 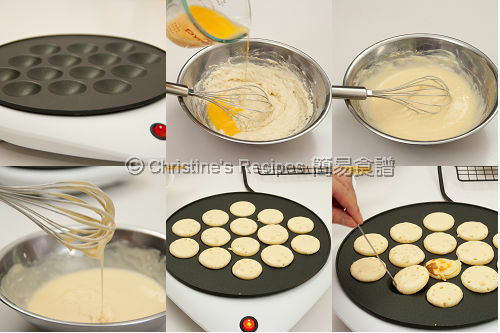 I want this ebleskiver pan, but it's too expensive; it looks like your pan. The pancakes look soooo good. LOL. I think it's really cute that your husband "talked you into it". I thot it would have been the other way around. Regardless, I think your Dutch pancakes are really adorable! What a great bargain! I still remember the pasta maker you got as well. You are really good in finding bargains! Thanks for sharing the recipe with us Christine - as well as the fantastic tips to ensure a perfect pancake. christine, cutie little pancakes! it's my first time seeing this kind of pan, thanks for sharing this..so i guess if i were to make this, just do it in a non stick pan. wow these pancakes look terrific! oh, these are such perfect little fluffy rounds! Very pretty! Yum! I got something similar that I got when I went on one of my shopping spree over the border last year. I used it to make "Takoyaki". Hmmm...wonder if it would work with this recipe?? Looks really yummy. I'm sure my son will love it ... just his size ... for his little hands! 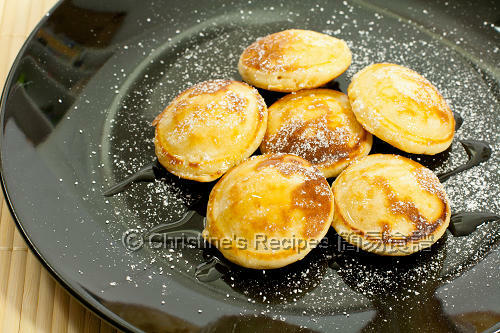 Christine, I have heard of Dutch pancakes but never actually had them. Now that I know what they look like I'm intrigued and can't wait to try them! It went down to 10dollars here in Target in Perth on Boxing Day!!!! I was very tempted, I looked at one and was procrastinating. I wanted a waffle maker and the dutch pancakes maker too, I could not make up my mind! I was hoping the indentation would be deep enough for me to make Takoyaki balls with it but form your picture, the indentation looks pretty shallow. No, I ended up buying nothing!!!!! Regretting it now after this pancake post, bummer! Very cool looking Poffertjes. I often see them at markets but I never get around to eating them as I always gorge on other treats. At $12 for the electric maker I think everyone should get into making these. Never tried this before but have heard about it from the HK TVB series. Think I saw this at Myer the other day .... must go and check it out again. So kind of you to share the recipe. Oh my, now I am craving these goodies and do not have the pan. I'm going to follow your excellent suggestions as I love these pancakes. Thanks for sharing and I hope your year is off to a wonderful start. These are just so dainty and fluffy and cute! I would get the pan and make them ! Mmmmm! This will be breakfast tomorrow! What a great pancake recipe! These are adorable! My kids love pancakes, so we will definitely be trying this recipe. The pan is very cool, I will have to check my Kmart for it too. Thanks for sharing! I bought a Dutch Pancake Maker today from Aldi for $7.99. Because I am Gluten Free I haven't been able to try any of the pancakes at the many markets we have here in Wagga Wagga. Now I will be able to make my own which I will be doing tonight.Thankyou for posting this recipe. Ronda B.
I love the pancakes and my daughter have eaten the whole plate! I bought one also, but lost the recipe sheet with suggestions for other pancakes. Can you share a few eg one with zucchini? Mine takes about 5 minutes or so. Put your hand over the machine a few inches high, without touching it. If you feel the heat, it's ready. QUICK QUESTION!! How many serves does this recipe make?? 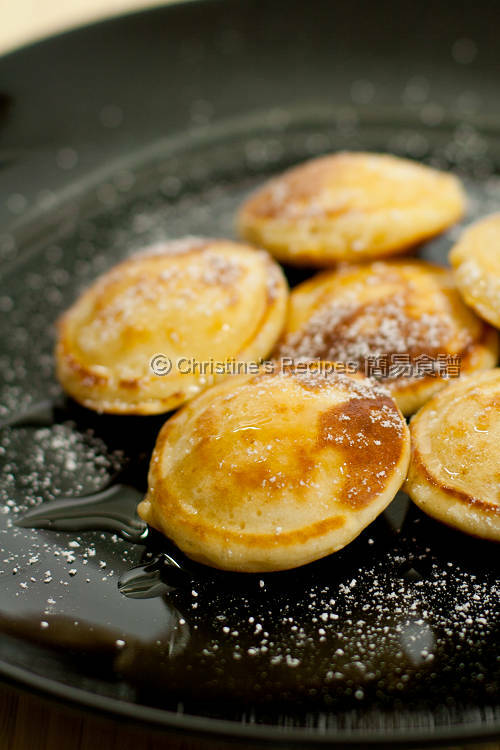 Sorry, I lost counts of how many Poffertjes I made on the day when shooting these photos. It should be over 20, enough for 4 people. How many dl is 1cup in you recipe? I use metric cup. 1 cup = 250 ml. Yes, they are freezer friendly. how many does this recipe make overall? Sorry, I made these pancakes long time ago and lost count. It should be over 20. My pancakes came out rubbery and chewy, only cooked on one side, not sure why. the heat was ok. So i am not sure why they came out bad. Do you know why has this happened? I followed your instructions but I am new to cooking so maybe the lack of basic knowledge made me miss out on a step or the way ingredients are mixed. Not sure, I am raising funds for children in need and have to perfect the recipe :(. Thank you so much. When it comes to making pancakes, don't over-mix the batter. Otherwise the pancakes will turn out rubbery as gluten is developed inside. Are they very different in terms of taste in comparison to American pancakes? The ingredients used are almost the same. So the taste will be the same.